Taste like kajang satay peanut sauce. 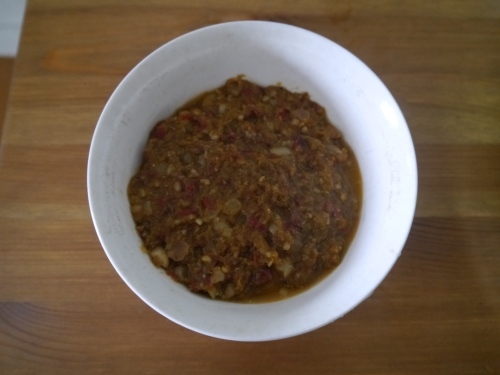 Kuah satay resepi or Peanut sauce satay recipe without coconut milk doesn’t taste good, that’s why it’s important to put coconut milk or santan into this satay sauce to obtain delicious satay sauce!. It’s easy to cook at home when you feel like eating Ketupat rice with satay sauce without satay meat. 1kg peanuts (Bake using oven on low temperature constantly turn peanuts to bake thoroughly every 3 min or so till slightly crunchy and brownish white) then use your hand to crush to remove peanut skin when they are still moderately hot. Use a siever to remove unwanted skins. It’s faster this way! After that, you can either blend half the portion into smaller size, and another half by using pestle and mortar to obtain bigger sized crushed peanuts. Update: Tips: Constant dry toast peanut with wok under medium to low fire it’s even easier to remove skin, compare to oven bake. 1 gula melaka (Huge big ones) Yup, the whole gula melaka!!.. You can purchase this in Supermarket. Cut it smaller size so that it can easily melt into your paste. 7 bulb red big onions (Bawang Besar) Yes, more red BIG onions !!! Put all blended ingredients and asam jawa juice, salt, sugar, turmeric powder, gula melaka into your wok and cook till gula melaka melted. Put peanuts and cook thogoughly. If it’s a bit dry, pour water till you have your desire paste. 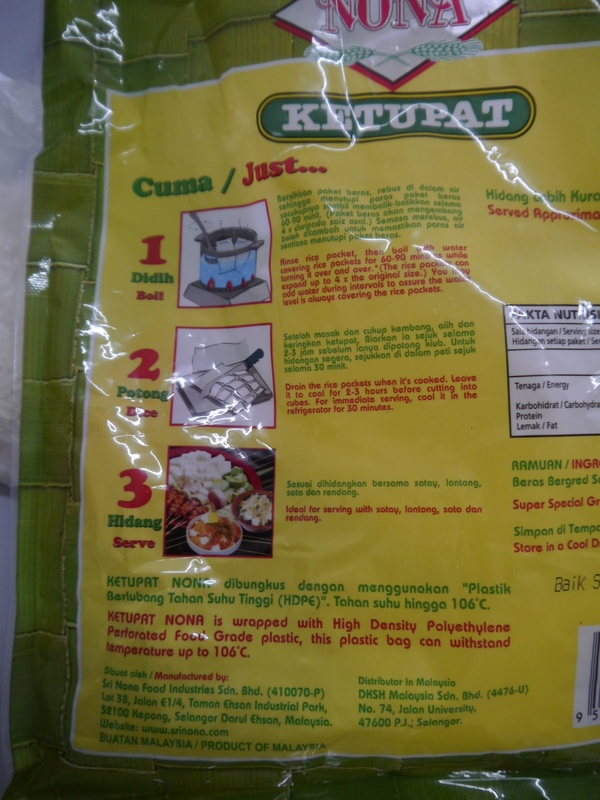 You can purchase “Nona Brand” ketupat, just put 2 packets of ketupat rice into a pot of boiling water and it will increase to 4x size serves 4 people. Cut some cucumber (timun )and onions to eat together with this kuah satay sauce. 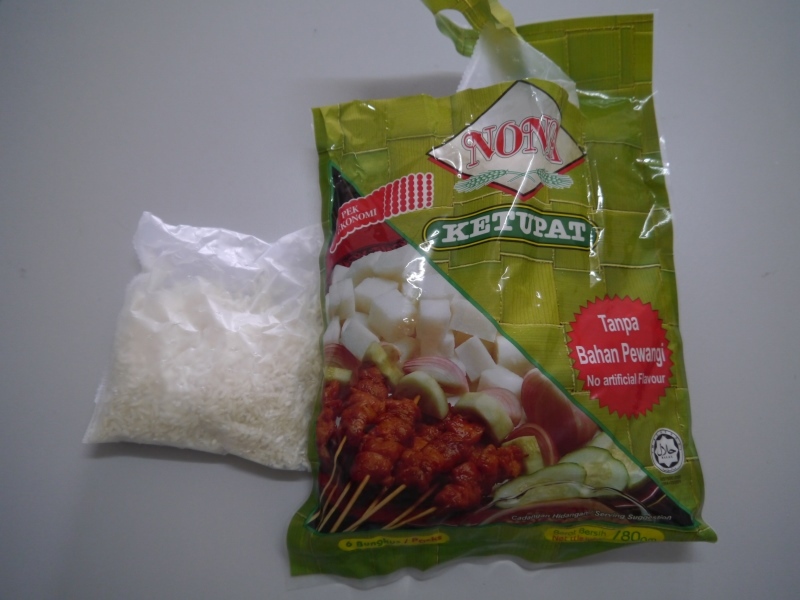 Note: Left over satay sauce can be kept into fridge and steam back next day, same goes to your ketupat rice. Have you heard of anyone substituting the coconut milk with condensed milk? I think can, although the taste wouldn’t be the same as coconut milk. Do you know know what makes kajang satay sauce so silky vs the Indonesian and Thai version? The depth of flavor is deeper. I suspect but do not know if it is the inclusion of sweet soy sauce and replacing some or all of the coconut milk with condensed milk. When I have been in Malaysia most good satay sellers in KL are very cagey with the recipes. They blended peanuts until so fine that’s why you can see it’s silky. As for the depth flavor, i don’t know the greatest recipe, you can try adding ginger, sweet soy sauce, coconut milk, condensed milk to trial out. And don’t forget to buy the peanut sauce u love and at the same time taste your own homemade, then you’ll be able to compare it.